"Websites - Main Jane Designs LLC"
These website designs show a wide range of completed projects. They offer design ideas and show some available features. Enjoy! 600 acre award winning urban wildlife refuge, which is one of Wisconsin's natural gems. Green Bay's largest park has been developed to offer many different opportunities to appreciate nature. From classes for toddlers to pond studies, hiking, skiing and animal rehabilitation, this project encompassed a lot of information. More complex page navigation than most websites in order to give viewers multiple ways to get to the information they seek. Extensive calendar reflects Parks & Recreation Department classes, as well as programs and events organized by WLS staff. Lots of internal page links to give viewers an outline at the top of the page of what they can expect to find on the page. Customized WordPress website, much of which the client can maintain. Online eNews sign up form integrated into the website. Google map for getting directions. Law Firm website with extensive content covering 7 attorneys and 9 areas of law practice. WordPress website, which the customer can maintain. Responsive design which adapts to different device sizes. Uses Google fonts to style headline texts more uniquely and maintain search engine visibility. Search engine optimization of content. Amy Hanten of The Cooking Mom is a TV celebrity who cooks up easy breezy recipes to bring families back to the table together. We enter new recipes, blog posts and events in the website, do weekly newsletters, and manage cookbook sales on Amazon. Keep website code updated and resolve any technical issues. Home staging business for realtors and home sellers. Shows potential clients examples of successful projects and describes how the services of staging and redesign add value and sell properties more quickly. Customized WordPress website with responsive design. Trained client to maintain website. The guild furthers education and fellowship for area amateur and professional woodworkers, and advances the collective interest of woodworking to promote good will, and to gain recognition through shows. Inside Ideas is an interior design firm serving clients in Wisconsin, Illinois, Arizona and Florida. Helped define and write content. Shot photos of people and most interior design projects. Portfolio feature shows off projects. Green Bay Chiropractic's owner, Dr. Maureen O'Connor, helps clients understand her range of services and find answers to commonly asked questions through her website. Through the design, she indicates she is approachable and well-trained, and her methods are gentle and effective. Uses responsive web design, which adjusts the page layout to the device size. On-site photography I shot for this chiropractor adds personality to the site. Google map on the Hours and Location page makes it more likely customers will find the business. Many internal page links help clients find the information they want on the Services and Frequently Asked Questions (FAQ's) pages. Online form source. Customers can print out forms and fill them out before their appointments. Uses a Google font to style headline texts more uniquely and retain visibility for search engines. Customized Wordpress website which I maintain. An abrasive waterjet cutting company with aggressive goals and great business ethics. Shot photos of people and products. Janna Zimmerman's family started a soft revolution. They create travel pillows for families in need. Her site communicates the mission, instructions, who benefits and how you can help. Non-technical backend makes updating the site easy. The Events page includes a google map with an easy way to request directions. Accomplished glass artist, Kelly Smith, needed an online portfolio to share her projects with the world. Customized WordPress website, which the client can maintain. 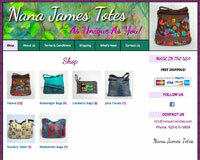 Nana James Totes is an ecommerce website for many kinds of designer purses and totes. The goals of the site are to make it easy for customers to see the latest products and buy them online. Uses a Google font to style headline texts more uniquely and maintain search engine visibility. Customized WordPress website, which customer maintains. Online portfolio for an artist blacksmith provides a way to prequalify customers. They see the heirloom quality of the projects and enough prices to respect the high caliber of work provided. Through the site, the artist successfully communicates with customers around the country. Requested links to this site from well-reputed related industry sites to increase search engine ratings. I designed and maintain the site. I shot many of the photos. Theresa Theiler Morton's perky artwork delights her clients around the country. She wanted a website that reflected her signature style, so I used ideas from her print catalog and translated them for the web. Database supplies the images and details about the artwork. Non-technical backend makes updating artwork easy. Various filters help customers choose what they want to see, like all the originals or just those available for sale. Page through filtered items at the thumbnail overview level or at the detail level. Sign up form for mass emails, so clients will know about the season's art fairs and special events. About Body is a therapeutic healing/wellness center, which provides alternative therapeutic treatment, education and naturopathic products to people with disease/issues with their bodies. Customized WordPress website, which the client maintains. Links to Social Media, like Facebook and LinkedIn. 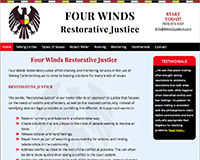 An organization designed to train people in the American Indian concepts of Restorative Justice and the Talking Circle. Customer supplied logo, and color scheme was developed to coordinate with it. Members Only website where businesses pool member fees to access crime reporting forms, training, investigative services, supplier discounts and event information. New members are assigned roles, like Subscriber, Editor... The role determines what kind of access the viewer gets to content. On logging in, viewers are redirected to different pages, depending on the viewer's role. Second navigation menu only appears on member pages once a viewer has logged in. Video gallery in members only pages. Search feature for searching training and other texts after log in. Sign up form for mass email program, so client can actively stay in touch with customers. St. Mary Catholic Community and St. Francis Xavier Parish are sister churches. I developed websites for both churches using one custom base style, then changing the color scheme, images and some content. New inspirational message appears each time the viewer goes to the home page. Slideshows reflect a vibrant faith community. Online registration forms include custom error checking to help registrants fill out the forms completely. Recaptcha code at the end of each form prevents unwanted automated programs from filling out and submitting forms. Emails are sent automatically to both the registrant and the church administrator with summaries of the data entered online. A non-technical backend to the site enables an administrator to update special messages and bulletins.